Vaccines, flu shots, allergy shots and more — get what you need to know to protect your health. Flu shot clinic dates for employees. Remember to bring your insurance card! 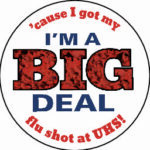 UHS provides free flu shots to students. Students can drop-in for tuberculosis (TB) skin tests Monday through Friday from 9 am to 4 pm, on the 6th floor of main UHS clinic.